Select a statement below to see how much you could save! ROBERTS GORDON® infrared heating equipment warms a space in the same manner as the sun warms the earth. A gentle blanket of low-intensity infrared heat spreads warmth that is received directly by people, floor, and objects within the space. As radiant energy continues to build it is absorbed into the surrounding surfaces. That energy is then released, heating the air through convection and re-radiation. This increases the Mean Radiant Temperature (MRT), which is defined as the uniform temperature caused by the combination of heat transfer from objects and radiant energy. Just like receiving energy directly from the sun, the increased MRT allows occupants to feel maximum comfort at a reduced air temperature. Because infrared heating directly heats the floor, objects, and occupants in a space, there is little to no stratification, reducing building heat loss and providing heat where it is needed. Because of the principles of infrared, there are many benefits that include: rapid heat recovery, electrical savings, clean and quiet draft-free heat. What is the Best Way to Heat a Space? The goal of heating a space effectively is to maintain the Operative Temperature (To). Defined in ANSI/ASHRAE 55, Operative Temperature is how warm a space feels versus its actual temperature. Because radiant energy heats the surfaces directly, the average MRT of the space tends to be higher than the Ambient Air Temperature (Ta). The formula below describes the relationship between To, MRT, and Ta when air movement across occupant level is less than 40 feet per minute. The majority of thermostats measure ambient temperature of air in a space. The necessary Ambient Air Temperature can be reduced due to the higher Mean Radiant Temperature achieved using ROBERTS GORDON® infrared heating equipment. 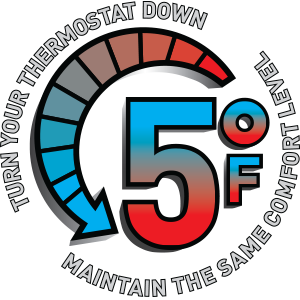 As a result, your thermostat can be set lower while still maintaining the same comfort level. The US Department of Energy estimates that for every 1° F that the thermostat is lowered, a corresponding 3% reduction in fuel use is realized. This means that, by lowering the thermostat setting by 5° F, up to 15% can be saved on fuel usage when compared to fuel usage using warm air appliances for the same facility. ASHRAE recognizes that infrared heating improves comfort and increases fuel savings when compared to other methods of heating. As previously mentioned, the principles of infrared heating reduce the number of Btu/h needed to comfortably heat a space and save energy in the future, in contrast to other heating methods. The standard heat loss equations and methods typically used were developed with a greater emphasis on forced air convection appliances and fails to fully characterize infrared heaters. An ASHRAE study was conducted to determine an adjustment factor for input energy requirements and energy savings garnered from infrared applications in contrast to other types of heating systems. The study concluded from these, and other points, that the Btu/h input required for a space using traditional heating methods, such as warm air heating, can be reduced by 15% to 20% when considering infrared heating installations. ROBERTS GORDON® infrared heating equipment will provide more comfort and fuel savings than any other heating method in the HVAC industry! To prove this claim, Roberts-Gordon teamed up with the BUILDING PERFORMANCE TEAM to create an energy model that compares heating a facility with ROBERTS GORDON® CORAYVAC® against a common direct fired make up air system. Specializing in commercial and industrial building performance, the BUILDING PERFORMANCE TEAM is an industry leader in Building Energy Modeling. President of BPT, Jim Dirkes, has been awarded certification as a “Building Energy Modeling Professional” by ASHRAE, joining a small group of building modeling professionals in the world. 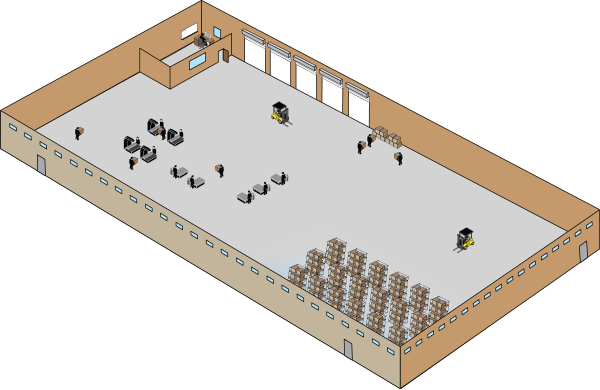 The energy model takes a typical 100,000 square foot warehouse using a combination of DesignBuilder (a 3D drawing tool), and EnergyPlus™, the US Department of Energy’s energy analysis tool. EnergyPlus™ is specifically cited as an acceptable analysis tool for LEED projects and meets all of the LEED and ASHRAE 90.1 specifications. DesignBuilder integrates a simple drawing / sketching interface with EnergyPlus™ and has been documented to produce essentially identical results to standalone EnergyPlus™ analysis. We payed close attention to detail by identifying all aspects of the application to determine energy usage. The construction of the warehouse will use insulation consistent with ASHRAE Standard 90.1-2010 for the building’s climate zone located in Pittsburgh, PA. 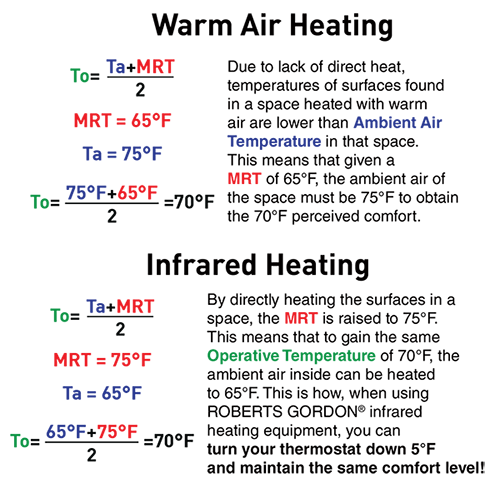 Both HVAC systems are in compliance with ASHRAE Standard 90.1 (Energy Standard for Buildings Except Low-Rise Residential Buildings) and ASHRAE Standard 62.1 (Standard For Ventilation And Indoor Air Quality). Included here and in each of the following systems, will be separate HVAC for the offices. Notes: 5 dock doors. Door opening frequency factored into building infiltration. 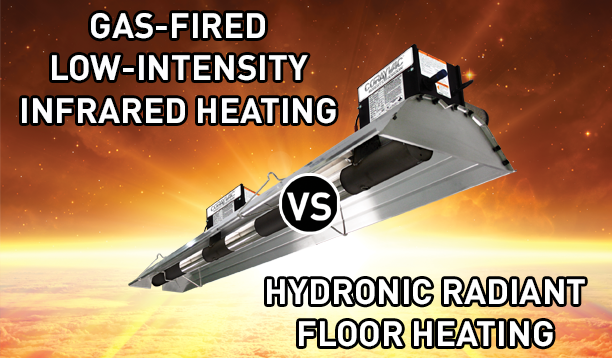 Hydronic radiant floor heating systems are effective, but lack the flexibility of Low-intensity infrared heaters. Hydronic systems do not heat by infrared energy, but by running hot water through tubing, such as PEX, imbedded in the concrete floor. The slab is heated by heat transfer from the water to the slab and then relies on convection to release the heat to the space. While this form of heating is effective, it is subject to transmission losses from the heat source, as well as the piping/pumping equipment to circulate the hot water through the floor slab. As mentioned, hydronic systems utilize boilers to achieve their maximum rated peak performance. The boiler may have a high efficiency rating, but it is the system that provides the seasonal efficiency or fuel use efficiency. A hydronic system may be subject to greater fuel usage when compared with a low-intensity system because there are standby and transmission losses through the boiler and piping. Because the boiler is often not located in the space being heated, the standby losses may limit the amount of heat generated in the space. 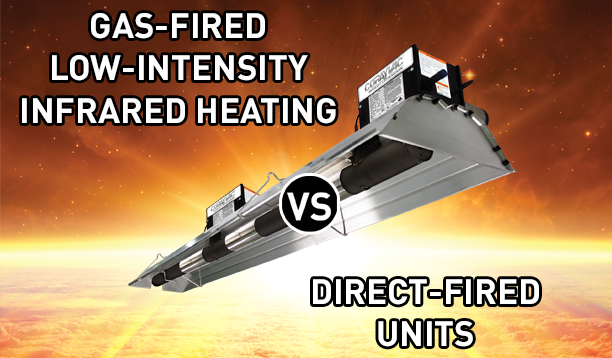 Direct Fired Make-up air heaters waste fuel because warm air rises to the ceiling, due to increased stratification. A direct fired MUA will push a large volume of heated air into the space. As the heated air is brought in, the laws of physics take over and the result is heat stratification. Warm air rises to the ceiling where it is wasted. Furthermore, direct fired systems heat a space by warming the air first, rather than the surfaces or occupants in the space. This can create drafts and uncomfortable hot and cold spots throughout the facility. Air turnover heaters waste fuel because warm air rises to the ceiling, due to increased stratification. An In-direct fired air turnover unit will throw a large volume of heated air around the space. As the heated air is heated, the laws of physics take over and the result is heat stratification. Warm air rises to the ceiling where it is wasted. Furthermore, in-direct fired air turnover systems heat a space by warming the air first, rather than the surfaces or occupants in the space. This can create drafts and uncomfortable hot and cold spots throughout the facility. Warm Air Unit heaters waste fuel because warm air rises to the ceiling, due to increased stratification. Gas-fired unit heaters push a large volume of heated air around the space. As the heated air is heated, the laws of physics take over and the result is heat stratification. Warm air rises to the ceiling where it is wasted. Furthermore, unit heaters heat a space by warming the air first, rather than the surfaces or occupants in the space. This can create drafts and uncomfortable hot and cold spots throughout the facility. of software, can be expected to precisely duplicate conditions that will occur in an actual building. Of the available energy modeling software, EnergyPlus™ is clearly the leader in modeling capability. The information in this document was prepared by recognized EnergyPlus™ expert users and are confident that we can represent the energy characteristics of each building very well. • Equipment, including office PCs and copiers, may change and operating patterns may also change. • Weather patterns vary from year to year. Our energy models use the actual weather that occurs during a specific billing period. Succeeding years will differ. • Equipment efficiencies, control sequences and controls calibration vary over time. We’ve taken exceptional steps to represent the performance of these heating systems fairly. Building results may vary. Nonetheless, we think you’ll find that our comparison is useful. Let’s talk!